I encourage you to never stop learning. In that spirit, here are some books I recommend to continue your journey of self-discovery and success. I’ll add to the list as I continue to find relevant titles. Just click on the image of any book that looks interesting and it will take you directly to Amazon.com. Enjoy! Do you want to stay in motion on the same trajectory—getting the same results—or do you want to change your trajectory and put yourself on a continuous path of success and abundance? The only way to shift your current path is to gain awareness and understanding of you. If coaching with Didi and Thinking Into Results isn’t what you’re ready for, here are some other excellent options. This is the book that inspired the movie “The Secret”. Learn the real secrets of success and wealth, however you define it — in your finances, career, health, family life, relationships — in Wallace D. Wattles’ groundbreaking book “The Science of Getting Rich: Updated for Today’s World.” This modern interpretation of Wattles’ work lays out an amazing yet simple path for achievement in every aspect of your life. Included is a self-study guide, designed to walk you through the process of making your own personal changes that lead to better results and a higher level of success. One of the leading authors in the New Thought movement of the early 20th century, this 2-book volume of Thomas Troward’s classic essays about mental science explore the relationship between the Divine Mind and the individual mind. The series of essays explain the nature of truth, unity with the Creator, and the power of creative thought in the improvement of our lives. These classics are a must-read for those who want to understand the truth of our existence, and how to use that knowledge to our benefit. Learn the real secrets to living a successful life in Wallace D. Wattles’ precursor to “The Science of Getting Rich” series. This practical guide is short and to-the-point and lays out the basic concepts of self-improvement, in a simple, easy-to-understand format that anyone can follow. One of the inspirations for the 2006 movie “The Secret,” Troward’s series of essays are an important part of the New Thought movement of the early 1900s, and continue to have meaning today. These lectures explore the relationship between your conscious and subconscious thoughts and the circumstances of your life. Learn the real secrets to being a great person in Wallace D. Wattles’ follow-up to “The Science of Getting Rich.” This classic work provides plenty of guidance on being the best person you can be by using the power of positive thinking. This classic work uses simple, easy-to-understand concepts that anyone can follow. This is the book Bob Proctor was given in 1961 that changed the course of his life. Written by Bob Proctor’s mentor, Earl Nightingale. Maltz was the first researcher and author to explain how the self-image (a term he popularized) has complete control over an individual’s ability to achieve (or fail to achieve) any goal. The remarkable story of Josh Waitzkin’s personal achievement. He shares the principles of learning and performance that have propelled him to the top…twice. The authors expose the fascinating ways that we can blind ourselves to our true motivations and unwittingly sabotage the effectiveness of our own efforts to achieve success and increase happiness. The thing you need most is to consistently “Be” your best self. Great book about making quantum leaps in your personal effectiveness. Learn the real secrets to living a healthy life in Wallace D. Wattles’ follow-up to “The Science of Getting Rich.” This practical guide lays out all you need to know about regaining and maintaining a perfectly healthy life, in simple, easy-to-understand terms that anyone can follow. Includes a summary of main points after each chapter. We all have projects in our personal, social, and professional lives that we need to manage. The actions you take to get organized and manage your project will determine whether or not your efforts lead to a successful outcome. You can achieve stellar results if you understand the basics of managing your time, your projects, and your life. This guide shows you how to improve and perfect your organization, time management, goal setting, problem solving, decision making, people skills, team management, leadership skills, and ability to get things done. Find True Wealth in your own backyard. Learn the real secrets to living a healthy and successful life in this 3-book volume of the works of Wallace D. Wattles: The Science of Being Great, The Science of Being Well, and How To Get What You Want. These practical guides are short and to-the-point and describe the basic concepts of positive thinking and self-improvement, in a simple, easy-to-understand format that anyone can understand. One of the most inspiring and impactful books ever written. It has transformed the lives of Presidents and CEOs, educators and parents. One of the twentieth century’s most powerful and intriguing works on how to use the manifesting powers of your mind. This book gets straight to the point of what success is all about. Full of practical advice for individuals who want to better themselves. An essential little volume which explains and promotes the direct connection between our thoughts and our happiness. How can we change our thoughts so that the result of every thought—the offspring of thought—sets us up to win rather than lose? Excerpts from Bob Proctor’s most popular workshop—The Matrixx. Bob Proctor’s International Best Seller. Do you know someone – perhaps yourself, a friend or a family member who feels stuck? Maybe they want to earn more money, lose some weight, improve their relationships or live a more fulfilling life? Not knowing what you want is so frustrating … or knowing what you want but not knowing how to get it is even more frustrating, and a sure recipe for failure and disappointment. In this video Bob Proctor gives you exactly what you need to ensure that you never experience another yo-yo diet, roller coaster bank account or dead end relationship again … and better yet to achieve or have ANYTHING you want. This is something you’re going to love and truly benefit from. It’s exactly what you need to ensure that you never experience another yo-yo diet, roller coaster bank account or dead end relationship … and better yet, to achieve or have ANYTHING you want. This year is in full swing and if you’re like me you’ve got some big things you want to accomplish! Well, the Proctor Gallagher Streaming Club can get you to where you want to go. In the Streaming Club you have the unique opportunity to join Bob Proctor and Sandy Gallagher several times a month for study sessions, powerful lessons, personal insights and you can even pick their brains on a regular basis. Have the life you’ve always dreamed of! Get rich in a predictable and reliable way with The Science of Getting Rich. Enjoy more abundance, joy and wealth without working harder or giving up all your time. The Science of Getting Rich is quite possibly the most impactful personal development program. It teaches the foundations of personal development, the law of attraction and achieving the life you really want. As such, it can teach you how to execute and achieve any goal with precision and accuracy. Bob Proctor used this powerful system to build practically his entire fortune. And it has served as the foundation for virtually every piece of work Bob has ever written, and all the most powerful seminars he has taught around the world. Those seminars have helped corporations worldwide improve their sales by hundreds of millions of dollars. If you want an infallible formula for wealth and success, The Science of Getting Rich is for you. Science has defined a variety of natural laws that explain the physical world and how it changes. One such law states that for every action there is a reaction, and that for every motion there is corresponding counter-motion. Whether it s visible to the human eye or not, one thing is certain movement and change will occur as a result. Having studied these principles, author Raymond Holliwell not only understood the universal physical applications, he also understood the spiritual and mental applications as well. helped millions of people transform their own lives. One of the things Bob credits for his spectacular life transformation is listening to Earl Nightingale’s classic program Lead the Field. It’s quite possible that Lead the Field has changed more lives, brought about more success, helped create more millionaires, and saved more careers, important jobs and marriages than any other program ever produced. The program had such a tremendous impact on Bob’s life that he has created The New Lead the Field Coaching Program. 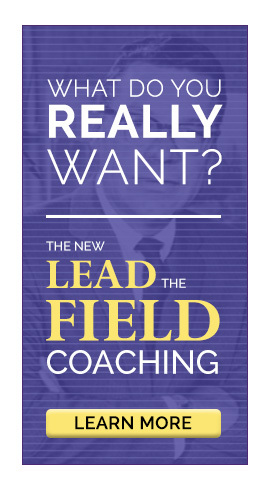 It’s based on Earl Nightingale’s timeless teachings, and it includes new audio lessons, coaching videos, and a 232-page workbook. program in the way it was designed. you’re currently living and how you want to live. And now, for the first time, Bob will teach the entire process during the LIVE Stream of Paradigm Shift on June 29 – July 1, 2018.